Convenience and savings. These are the two keywords that will be driving up the online sales numbers this holiday season. As the National Retail Federation’s 2011 Holiday Consumer Intentions and Actions Survey predicts about 36% of all shopping tasks will be done online. This includes researching products, comparing prices and buying. If you consider the actual purchase only - over 46% of the surveyed people plan to buy the gifts for their loved ones online. eMarketer estimates US retail ecommerce holiday sales will increase with 16.8% to $46.7 billion in 2011, up from $39.9 billion in 2010. That means that online sales growth will reach double digits despite the economic uncertainty and the tight budgets of the consumers. This is largely due to the fact mentioned above – more and more price-conscious customers are hunting for a better deal online. The proliferation of mobile devices – smartphones and tablet computers – is also making it easier for the customers to choose and buy their gifts. However, it also means that the servers of the major retailers must be well prepared to take the shopping load. A slight delay and a brief moment of downtime and the customers will go to the competition. Given that the Holiday sales form about a quarter of all online sales (23.9%) it is easy to understand why the uptime and the performance of the retailers’ websites will be of crucial importance. To see how the best in the industry perform during this time of high traffic, WebSitePulse is monitoring ten of the most popular online shopping destinations for the 2011 Holiday Season. The Reports reflect a typical online purchase transaction, like selecting an item, adding it to the shopping cart and checkout, representative for the End Users' interactions with a website. Measurements of the multi-step transactions are made every 15 minutes, simultaneously from 3 different US cities. The information from the report will provide insight into the End Users' shopping experience, the reliability of the IT infrastructure of the selected Internet retailers, and their estimated losses in case of downtime and failure of critical websites, web pages, web systems, network devices, and web applications. The reporting period covers the dates between November 23, 2011 and January 5, 2012. 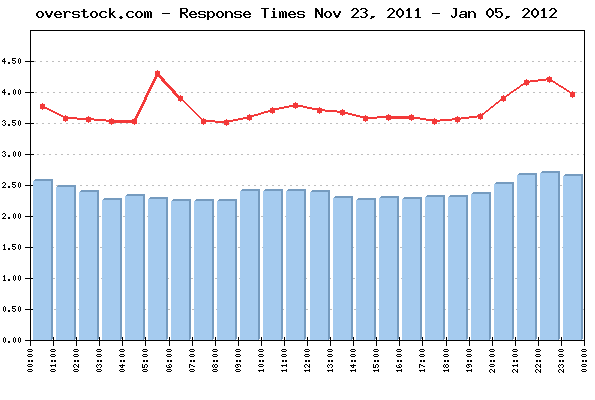 The daily Average Response time from all monitored websites was 3.729 sec. The Average Response time as measured from the US East Coast (Washington, DC) was: 2.991 sec. The Average Response time as measured from the US West Coast (Los Angeles, CA) was: 4.600 sec. The Average Response time as measured from the US Central (Chicago, IL) was: 3.595 sec. The Best Response time measured from US East Coast: 2.022 sec. The Best Response time measured from US West Coast: 2.551 sec. The Best Response time measured from US Central: 1.876 sec. 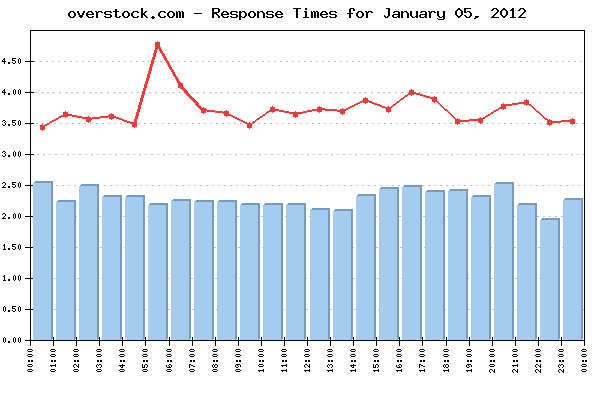 The typical shopping transaction took the least time for overstock.com visitors - 2.277 sec., while the visitors of amazon.com had to be the most patient, as the shopping transaction there took in average of 5.922 sec. 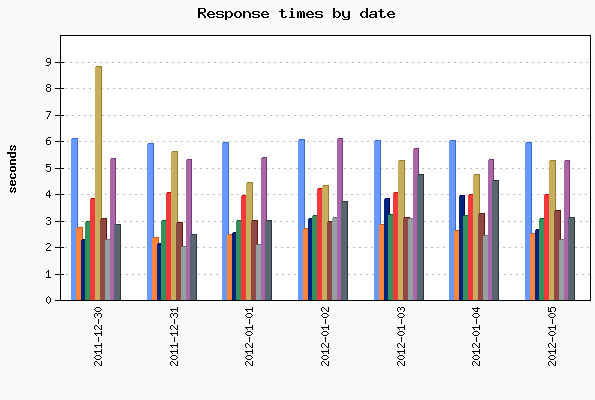 Four of the monitored websites delivered above-the-average response times for their transactions, while six of them demonstrated below-the-average daily performance. No events of particular importance or possible negative impact on the online visitors' interaction with the Websites included into the 2011 Holiday Season report were detected during the reported period, and according to WebSitePulse, the Group delivered the expected levels of End-User experience and Customer satisfaction. The 2011 Holiday Season Reports reflect a complete web transaction, representative for the End Users' interactions with a website. The reporting period covers the dates between November 23, 2011 and January 5, 2012. Performance and availability measurements are made for a typical multi-step web transaction at 15 minute monitoring interval, every day 24/7. The WebSitePulse application monitoring service is used to collect data and to create the reports.